Ingredients: Gelatin, potassium bromide, potassium iodide, and silver nitrate. Equipment: film or glass plates, metal plates, plastic stirring paddle, cheesecloth, gloves, safelight with light red filter (Kodak 1A or equivalent), 1 liter glass beaker or stainless steel bowl, 4 liter glass beaker or equivalent stainless steel bowl. A mechanical stirrer would be useful, but is not essential. 1. Dissolve the gelatin. Dissolve 10 grams of gelatin in 360 ml warm distilled water. 2. Dissolve the potassium bromide and potassium iodide. Add 32 grams of potassium bromide and 0.8 gram potassium iodide to the gelatin solution and stir until dissolved. 3. Heat the solution. Heat the mixture to 130º F (55º C). The solution must be maintained at that temperature. The simplest way to do this is to surround the solution with a water bath. 4. Lights out. Turn out normal lights and work under a light red safelight. 5. Make a solution of silver nitrate. Wear gloves when working with silver nitrate. Dissolve 40 grams of silver nitrate in 400 ml distilled water. 6. Combine the silver nitrate and gelatine solutions slowly. This is known as the precipitation stage. Add the silver nitrate solution slowly to the gelatin solution at a rate of 20 ml every 30 seconds for 10 minutes, stirring constantly. The more slowly the silver nitrate is added, the larger will be the silver halide grains produced--and the larger the grains, the faster the emulsion. 8. Swell additional gelatin. Soak 40 grams of gelatin in distilled water until softened (20-30 minutes), then pour off the excess water. 9. Combine the solutions (emulsification). Add the softened gelatin to the silver nitrate solution and mix thoroughly. Cool the mixture and allow it to set (this usually takes 2 to 4 hours). 10. Strain through cheesecloth. Place the emulsion in a square of cheesecloth and fold the cloth over it. Hold the emulsion in a pan of cold water and twist the cloth so it is squeezed through the pores in the cheesecloth, making a kind of gelatin spaghetti. This is necessary in order to remove excess silver salts. 11. Leach out the excess salts (halides). Pour off excess water and place the shredded emulsion in a large beaker or other container. Pour 3 liters of cold water (below 68º F or 20º C) onto the shredded emulsion, let it sit for 2.5 minutes, then pour off 2 liters of the water and add 2 liters of fresh water. The use of distilled water is recommended, to reduce the possibility of unknown contaminants in the emulsion. 12. Repeat. Repeat the washing process 5 times, using cold water. Pour off the excess water. 13. Melt and after-ripen. Melt the emulsion by heating to 130º F (55º C) for 15 minutes, then slowly cool it to 104º F (40º C). The after-ripening doesn't increase grain size much, but does increase speed. 14. Coat. For a 3½ by 4½ inch glass plate, use 4 ml of emulsion solution. Pour it on the glass and spread it unformly. This formula should make enough emulsion for approximately 100 such plates. 15. Chill. Place the coated glass on a level cold metal plate until the emulsion sets, then place in the dark to dry. 16. Expose. Make your first test exposure at 1/30 second at f/8, and adjust up or down as necessary. 17. Develop. Develop in an active developer such as Kodak D-8 (2:1), HC-110 (Dilution A), or Dektol (1:1). 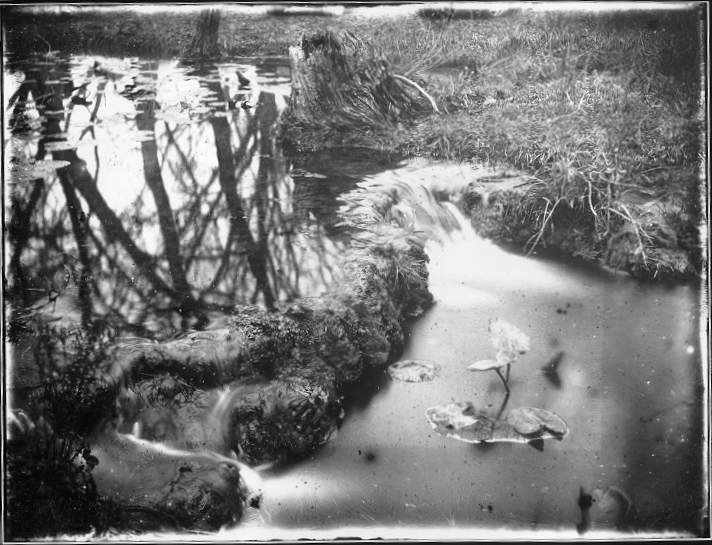 Print from a glass plate negative using a handmade silver bromide emulsion, by Terry Holsinger. Kodak Publication AJ-12, "Making a Photographic Emulsion." The Focal Encyclopedia of Photography, under "emulsion." Practical Photographic Chemistry, by O'Hara and Osterburg.